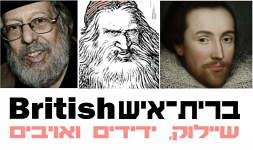 Out of Avraham Oz's recent production/adaptation of Shakespeare's The Merchant of Venice at the Alfa Theatre of Performing Arts, Tel Aviv (2016) came this talk about the origins of Shylock in Britain, both the pioneering land of expulsion of Jews and blood libels against them, and of admiration for, and adherence of Jewish history, language and thought to the point of the British regarding themselves as the spiritual descendants of ancient Israelites. The talk, introducing the first emigration of Jews into England with William of Normandy («The Conqueror»), their expulsion from England two centuries later, the myths and archetypal images of them during their 350 years of absence from the British Isles, and their ambiguous reception upon their return. What is Machiavelli doing in a British play about Barabas, the Jew of Malta? How come the model tragic hero of 17th century England is Samson, eyeless in Gaza? And what is the Robles precedent, helping to preserve the Jewish presence in England? All this are to be answered in a fascinating, entertaining and well informed talk. Entrance free of charge, online registration is required.